Have you ever seen a hamster in a cage that’s running fast and furious on its little wheel? The hamster will jump in the wheel and, after a step or two, will beginning running in place with the wheel spinning around and around. Do you notice how far the hamster actually gets? That’s right…nowhere. The wheel is a distraction for the hamster. Other than a little exercise, nothing is really accomplished. This same thing happens with the job search for many people. They post their poorly written resumes across the Internet using resume distribution services, they scroll through job postings on CareerBuilder a few times a week, they read the newspaper only to lament on the current job situation, and they might attend a network meeting or two at a local church or community center. Then they go back to their usual life of crying with Oprah, disagreeing with Hannity, or laughing with Conan while they sit on their couch and collect unemployment insurance. That’s right…they get on their virtual hamster wheel for a few hours a week and then, feeling as if they accomplished something, they go about their daily lives waiting for a career opportunity to jump in their lap. Nothing really changes because they are modestly content with their life on the job hunt hamster wheel. To be effective in this job-hunt market, you must stand out from the crowd. You must learn how to make effective use of the Internet, of network meetings, and other job search strategies. You have to get off the wheel and figure out a way to bust out of your hamster cage. So let’s look at a couple of key changes you should make. I can’t over-emphasize this. To get to the interview, your resume has to cut the mustard…it must be excellent. Even with the benefit of a professional introduction or having a friend hand-submit your resume, a poor resume can sabotage your career prospects. You need to spend some serious time reviewing, rewriting, revising, and re-spinning your resume content and format. However, we are often limited to our current skills in Word and using some built-in resume template that causes more problems than it solves. Therefore, here’s my best suggestion…Get Professional Help. Hire a Resume Writer. It’s hard for us to be objective about ourselves and our career and even harder to be an expert with writing/formatting resumes for ourselves. So find a modest-priced, reputable, certified resume writer and get their help pulling together your resume. Get at least a 1) Chronological resume, a 2) Cover Letter template, and possibly a 3) Skills or Combination or Functional version of your resume, depending on the guidance of the writer. Keep the format clean, simple and neat…avoid strange layouts or fancy formats or parchment-printed copies (“No whipped cream or sprinkles, please!”). Turn down offers for mailing services, or fax distributions, or “ResumeRabbit” styled submissions services, and any other “campaign” offers…but definitely get them to help you with a LinkedIn profile. Make sure you end up with electronic copies of your resumes in Office 2007 (.DOCX) or 2003 (.DOC) format so you can edit and refine them for each unique job opportunity. You probably already know what my first bit of advice would be…Get in the Game! The world has changed in the last 10 years. If I can’t see your professional “footprint” somewhere on the Internet, I have to assume you either aren’t really skilled, you aren’t willing to adopt to new changes/technologies, or you’re hiding something. While these assumptions might be a stretch, in this job search environment I gravitate towards interviewing candidates that have a digital identity. In years past, a candidate might bring a “portfolio” of their work to the interview. Today, it’s a bit reversed, in that I try to find out if they have a career-focused digital identity that endorses the skills they’ve advertised in their resume prior to their arrival at the interview. Before I interview someone, I search for them on the Internet. Do they have a LinkedIn profile and does it complement/match/contradict the resume? Do they have an Amazon Reading List and what types of books are on it? Do they participate in the more common professional online forums relative to their (my) industry? Do they offer sound advice in the “help” forums? Do they tweet career-focused information on Twitter or are their messages off-topic (avoid politics, ranting, etc.)? Do they blog/write something of interest that can be considered professional or career-focused? Can I see their Facebook page (Hey, if it’s publicly accessible, it’s free game! ), and if so, do they present themselves in a way that won’t embarrass my firm? Do you get the point? Get your digital portfolio or digital image developed and refined. Before you become unemployed, you need to define how you are going to stay (or become) an expert in your field. Don’t depend on your employer to take the lead on this. In years gone past, when you might have been with an employer for your whole life, it made some sense to let them define a career path and relevant training for you. But today, with most people being in a job for 5 years or less, YOU need to define your career path and the training needed to get there. If your degree is over 5 years old, you need to start attending industry-related conferences once a year. If your degree is over 10 years old, it’s 2 conferences a year…at least one of which you teach, lecture or provide a knowledge-support role to others. If your degree is over 15 years old, it’s probably time to consider a new degree…either pursue an advanced degree or obtain an industry certification as a minimum. If you’re already unemployed, all the above is still relevant, but within 6 weeks of leaving your job you MUST be involved in some structured training, education, or certification program. Otherwise, I just see you as that fat hamster resting on the laurels of your prior (and maybe irrelevant) education without the ambition to develop or enhance your skills. Have a plan to stay skilled and relevant for the rest of your life. Bottom Line: Don’t be a job search hamster by being professionally invisible, insignificant, or irrelevant. Get some help with your resume so you can use it as an effective marketing tool to present yourself effectively in your job search process. Build an industry-relevant identity that can be “found” on the Web by those that could use your skills or those that might be looking to validate your statements. Education didn’t stop with your last diploma or when your boss said there wasn’t a training budget…you are your own career guidance counselor, so ensure your training/education is up-to-date and relevant for industry needs. 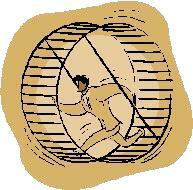 Get off the hamster wheel and improve your job search in a meaningful way. This entry was posted on Wednesday, May 30th, 2012 at 6:21 pm and is filed under Job Search, Job Searching, Jobs, Resume Writing, Resumes. You can follow any responses to this entry through the RSS 2.0 feed. You can leave a response, or trackback from your own site. This blog entry comes to me just in time! I just sent out a batch of resumes and was thniikng to myself that maybe I should have taken off the date of the schools I attended, now that it is almost 13 years since I graduated from law school. Thanks so much for the advice on this point. I’ll definitely keep those dates on now, now matter how old it makes me feel!